Learn how SIMATIC WinCC SCADA products can help you today meet the challenges of tomorrow! 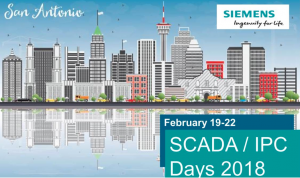 Siemens Industry, Inc. is pleased to announce its creation of the second annual, three-day, SCADA/IPC Days 2018 – User Community Event. This event will offer all attendees an opportunity to join informative dialogs with Subject Matter Experts in SCADA system software and Industrial PC-Automation solutions in order to gain unique product insights, integration tips and tricks, plus secure your input(s) and share forecasts on future product enhancement(s), and much more! Price: Free! Seating is limited. Register today. Learn more about Siemens SCADA/IPC Days 2018.